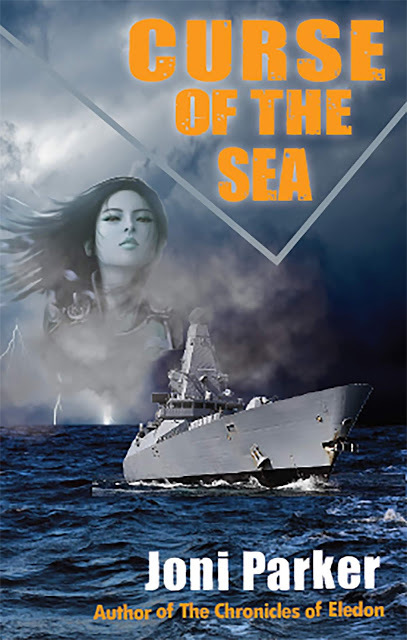 Welcome to the book tour for Curse of the Sea by Joni Parker! Today I have an interview with the author to share with you. If you follow along the tour, you will also find other excerpts, book reviews, guest posts, and author interviews. Plus there is a giveaway at the end! I went to the U.K. for a ten-day visit. My trip started in London and went to Portsmouth from there, then to Glastonbury, Edinburgh, Glasgow and back to London. It was great fun and very informative. In addition, I spent a lot of time researching the Internet for all kinds of subjects from the super moon to assault rifles. I also read a lot of books and watched TV and movies (anything British!). My favorite character was Edgar Winters, my main character’s brother-in-law. He reminds me a lot of my husband, but he looks like Matthew McConaughey. How good is that? I actually relate to Detective Sergeant Pennington. She’s very serious and maybe, tries too hard to be perfect, like me. She gets flustered easily when things aren’t going her way. In a nearby field, the helicopter landed. Detective Inspector Tyler hopped out, followed by Detective Sergeant Smith. The two men jumped into a car with flashing blue lights. Jeffrey stared at the activity, counting the number of men. He glanced at Alex—she was also counting. “Thirty men on foot and two with dogs.” Alex took a deep breath. A line of military vehicles drove up and men in black uniforms ran out. “Look, Nana! It’s the SWAT team!” The boy pointed at the vehicle. He jumped up and down with excitement. “SWAT?” Alex didn’t like the sound of that word. “Well, it’s officially called the Specialist Firearms Command, the SCO nineteen, but I like SWAT better. It stands for Special Weapons Assault Team…I think,” the boy said. “You’ve been watching too many American shows on the telly. I’ve told your mother about that,” the woman said. “Not now, my lord. Tell me later. We really need to use it now. They’re coming.” In the pit below, a white arch glistened, filling the dark hole with light and a buzzing noise. She turned to the woman. “Thank you so much for your help, but we have to go.” She gave the woman her candle back. “What’s that buzzing, Alex?” Jeffrey asked. “An improvement of some sort. Come on!” Alex slid down the side of the pit and scrambled toward the arch with Jeffrey next to her. Most of the characters will be seen in the next two books to finish off the trilogy. Alex Dumwalt is the main character and she has been in every one of my books from the beginning. I’ve published two other series. The first one was called “The Seaward Isle Saga” and is composed of three novels, “The Black Elf of Seaward Isle,” “Tangled Omens,” “Blood Mission,” and a short story, ”The Island Game: The Inside Story of Seaward Isle.” The second series was called, “The Chronicles of Eledon” and features four books, “Spell Breaker,” “The Blue Witch,” “Gossamer,” and “Noble Magic.” In addition, I’ve published some short stories in a recent anthology, “Tucson and Beyond,” published by my local writing group. I like to read a variety of genres. I just finished “Saturn Run” by John Sandford and Ctein, a science fiction novel and just started “The Skin Collector” by Jeffrey Deaver, a crime mystery. I’ve retired from two jobs so I no longer need to work to keep a roof over my head. But I wake up early every morning and walk two miles (treadmill), swim for a half hour (my complex has a heated pool so I swim all year around), watch sports on TV, take in the local sights, and read. Writing and all that goes with it takes up most of my time, however. Win a print copy of “Curse of the Sea”! Follow along the tour for more chances to win! Thanks for hosting my book! I enjoyed doing the interview.